The Secretary’s Innovation Award for the Empowerment of Women and Girls seeks to find and bring to scale the most pioneering approaches to the political, economic and social empowerment of women and girls around the globe. Funded by the Rockefeller Foundation, the award is part of the State Department’s continuing emphasis on public-private partnerships, and is administered by its Office of Global Women’s Issues. The award, and the office, are founded on the premise that the major economic, security, governance and environmental challenges of our time cannot be solved without the full participation of women at all levels of society. The Rockefeller Foundation, as part of its mission to expand opportunity and promote more equitable growth, seeks to identify innovative approaches that can be scaled to address these challenges. There are several important documents you'll want to have ready when you meet with potential investors. Your mission statement. Your founding team's resume and responsibilities. A business plan. 1. Trust. Potential investors are not your competition, and asking them to sign an NDA is often interpreted as a sign you don't trust them. As professional integrity is important to VCs, requiring an NDA is generally seen as a violation of business etiquette. Senator Jack Reed, Democrat of Rhode Island and a member of the Senate Banking Committee, on Monday filed an amendment to the financial reform currently in the Senate that would require all hedge funds, private equity shops and venture capital firms to register with either a state regulator or the Securities and Exchange Commission, Politico reported. The amendment would mean that funds under $100 million, previously exempt from the proposed regulation, would now also be required to register. “Hedge funds, private equity and venture capital funds have played an important role in providing liquidity to our financial system and improving the efficiency of capital markets. But as their role has grown so have the risks they pose. This amendment will shut down loopholes and provide the SEC with long-overdue authority to examine and collect data from this key industry,” Mr. Reed said in a statement to POLITICO. Intel chief executive Paul Otellini predicted today that the company will be shipping a billion chips a year within the next five years. On top of that, revenues and profits are expected to grow at low double-digit rates, or more than double the rate of the past five years. Otellini made the prediction at the company’s analyst meeting in Santa Clara. He said that he expects the computing market to have a 15 percent to 16 percent compound annual growth rate for the next five years. Otellini said that the growth will happen on a variety of fronts. Desktops computers will grow a mere 2.4 percent CAGR through 2014. But laptops will grow 22 percent, netbooks will grow 15 percent, and tablet computers will grow 73 percent to 88 percent. Everyday objects with their own IP addresses may soon be the norm. This communication of objects with the Web is the latest version of a still-idyllic new vision of technology that claims it will improve our lives. Yet we're at such an early stage of development of the Internet of Things that finding the best blogs to follow is a moving target. Many of the 10 offerings below have only come into being in recent months. Not making our list is a ReadWriteWeb favorite - Pachube - which has been remiss in updating their blog. So stay tuned for updates in future posts. For now, here are what we believe to be the 10 most active blog feeds available on the Internet of Things. The Internet of Things Council is a European think tank of the best minds in the burgeoning Internet of Things sector. From forecasting to developing prototypes, the council members' commonality is the "range of emotions and conceptual breakdown that comes with grasping the territory, the full logistical, business, social and philosophical implications of the Internet of Things." You can access their blog feed here. Can New Brunswick become the Davos of entrepreneurship? Barely a week after the mighty St. John River overflowed its banks in Fredericton, the stately New Brunswick capital was invaded by another unstoppable force of nature: entrepreneurs on a mission. More than 80 business owners from across the province attended the one-day New Brunswick Entrepreneurs Summit to learn each other's success secrets and hone their networking skills. But founder Rivers Corbett, the owner of Fredericton catering firm Chef Group, has his own mission: To turn his province into "the Davos of entrepreneurship." Can Canada's eighth-largest province (pop. 750,000) become a raging source of entrepreneurs? It has happened before. Consider the success of Max Aitken (the financier who became Lord Beaverbrook, the first "Baron" of Fleet Street), not to mention the Irvings and McCains. Over the weekend, startup accelerator TechStars announced a partnership with Startupbootcamp, a Copenhagen-based incubator and the very first member of a new global affiliate program hosted by TechStars. With programs in Boulder, Boston and Seattle, TechStars is now expanding and "open sourcing" their incubation model by providing guidance and support for independent international startup accelerators. A TechStars presence in Europe, in any way, shape or form, is a positive step for seed funding in Europe, which - as we've discussed earlier - is in dire need of growth. Startupbootcamp is a three month program running from August through October where a select group of companies will fine-tune their ideas, develop prototypes and develop their business. At the end of October, the teams will present their products to a group of over 100 investors in hopes of securing further seed or Series A funding. The days of dial-up modems may be gone, but some websites are still surprisingly sluggish. The issue has gained urgency after Google recently introduced a change to its PageRank algorithm that rewards sites that run faster. The search company says that users spend less time interacting with slower sites; adding to the issue are users visiting sites from mobile devices with spotty connections. Aptimize, a startup based in Wellington, New Zealand, that launches its service in the United States today, says its software can speed up website load times, bringing increases of 200 to 400 percent in some cases. It says it can achieve these improvements entirely in software. Ed Robinson, cofounder and CEO, says that companies often improve the speed of a website by throwing hardware at the problem. He contends that the fundamental problem is often the structure of the website itself. Because the recession has been quite severe, a lot of the recent discussion of employment has focused on the time period since the recession began in December 2007. As you no doubt know, over that time period, the jobs picture hasn’t looked pretty in businesses of any size – small, medium, or large. But if we look at the jobs situation over a longer period of time – since 2000 – the pattern is different, particularly across businesses of different sizes. 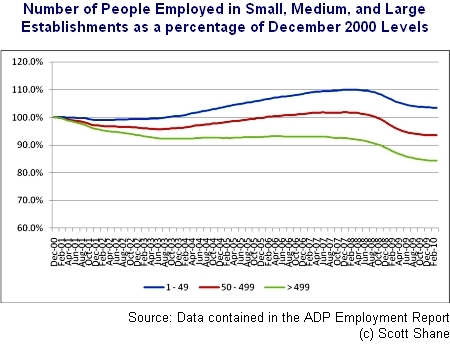 In the figure below, I have plotted the number of people employed in small, medium, and large establishments relative to their level in December 2000, using data collected by Automated Data Processing (ADP). ADP reports monthly numbers on employment in small (1-49 employees), medium (50-499 employees) and large (more than 499 employee) private sector establishments that use its payroll services. This special issue, 169 Best Illusions, contains a smorgasbord of static images that appear to be moving (such as the Hatpin Urchin shown here), “impossible” sculptures, freaky faces, ghostly afterimages and even some edible illusions. Illusions make great eye candy, but they also serve a serious purpose. When we look at an illusion, we “see” something that does not match the physical reality of the world around us. Scientists take advantage of this discrepancy between perception and reality to gain insights into how our eyes and brains gather and interpret (or misinterpret) visual information. Here’s a sneak peek at 10 different types of illusions and what they reveal. Technically Philly was able to stop in to see half of DreamIt Ventures’ kick off weekend at the University City Science Center last Friday where local media, entrepreneurs and participating companies got a chance to network and prepare for the incubator’s third class. It was the first time that the participating companies were able to see the space and meet one another. New this year is Brooklyn-based edication investor Startl’s involvement. The group partnered with DreamIt to incubate five of Dreamit’s 15 participating companies.